This page is about the American SPAA M42. For the version in the Japanese tree, see M42 (Japan). For the Italian SPAA with a similar name, see M42 (Italy). The Twin 40 mm Self-Propelled Gun M42 Duster is a Rank V American self-propelled anti-aicraft gun with a battle rating of 6.3 (AB) and 6.7 (RB/SB). The M42 was released in Update 1.47 "Big Guns". It is currently the third to last tank on the American SPAA line up, preceding the M163 Vulcan and M247 Sergeant York. While armed with the same turret and cannons from its predecessor the M19, it has enhanced mobility by using the chassis of the M41A1 Walker Bulldog light tank. The M42 "Duster" is a self propelled anti-air vehicle. Not much more to say. Stay behind and close to allies, but outside the enemies view-range and with clear line of sight to the horizon for low aircraft. Compared to certain other SPAAs (ZSU-37, Wirbelwind, Multiple Gun Motor Carriage M13, etc.) the M42 cannot be used effectively in an anti-vehicle role. The average battle-rating is too high and the penetration value of the AP shells too low. The armour is not strong enough against the devastating tank HE shells. However the armour performs okay versus machine gun fire from aircraft, but auto-cannon fire is a problem. 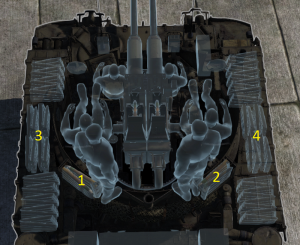 Thankfully the fuses of most tank APHE shells are not very sensitive, rendering the HE content useless and the entire shell into a mere AP solid shot. But, the machine is tiny and damage still very likely. Default AP-T / HEFI-T* These work fine, a hit on an aircraft means instant disassembly for it and still is able to hurt ground vehicles, especially if it is side into the side of a enemy tank. These seem like a good I don't know what i will run into belt. Mk.II HEFI-T* These mean bad news for aircraft, what should be used for AA work. M81A1 AP-T These are the worst belts against airplanes. however, they are able to hurt ground vehicles especially if it is side into the side of a enemy tank. If you plan on penetrating tanks, load this and flank, since side shots are almost a necessity. Ammo racks of the M42 Duster. With the dual 40mm Bofors the Duster has an excellent tool versus bombers and armoured attackers. Reserve the fire for certain hits. Against fighters the same tactic should be applied. There is no reason to spam the fire, unless sitting on cap-point for rearming. 40mm cannons are devastating to planes. AP rounds able to penetrate roughly 60 mm can be used against most medium tank side armour it could face. Unsynchronized firing helps improve overall fire rate to double that listed. Outside from default belts, the other belt options are made of a single type of shell that can be relied on. Relatively fast vehicle with good mobility due to the M41A1 light tank basis. Fast turret traverse rate helps track aircraft. Despite 40 mm cannons and the unsynchronized firing, the overall fire rate is still lower than its contemporaries. 40 mm AP rounds are not the best AP rounds to use overall due to relatively low penetration. Open turret allows aerial attacks and machine guns to decimate the exposed crew. Careless driving can damage the vehicle. Ammo can be used up rather quickly due to the dual-gun firing, prolonged combat can find the ammo stowage run empty. Easily ammo-racked due to racks scattered all around turret, aerial autocannons could set it off if hit. During late World War II and the Korean War, the US Army were using the Twin Gun Motor Carriage M19 as their main armoured forces anti-aircraft gun. However, during the Korean War, the US Army decides to phase out their M24 Chaffees and its variants, M19 included, in order to implement newer designs made in the time period. One of these newer designs was the development of the M41 Walker Bulldog light tank. The 40 mm armament on the M19 was deemed effective enough to continue usage past the M19, so the turret of the M19 with the twin 40 mm cannons were taken off the chassis and modified to fit the chassis of the M41 light tank, which had a larger turret ring than the M24 Chaffee. This installment of the anti-aircraft armament onto the M41 light tank was designated as the M42. The production of the vehicle began in early 1952 at the General Motors Cleveland Tank Plant and entered service in 1953, replacing the many other self-propelled anti-aircraft vehicles the army was fielding. Production continued from 1952 to December 1959, ending with a total number of 3,700 units. 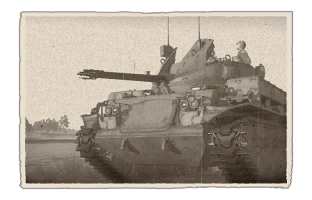 During the production, the M42 was upgraded in 1956 with a new engine and other upgrades common with the M41 light tank, this upgraded variant was the M42A1. The M42 was kept in US inventory past the Korean War, however it was sometime between then and the 1960s that the US Army came to the conclusion that ordinary anti-aircraft guns are unable to engage the new aircraft age of jets. Thus, the M42 was to be retired in 1963 and replaced by the HAWK surface-to-air missile. Though, even after their retirement, the units stationed at the Panama Canal Zone kept their M42s until the 1970s. Then in the 1960s, with the intensity of the Vietnam War brewing up, more American soldiers get stationed in the country. Experiences with the missile showed that the HAWK missile system suppose to engage the new jet planes preformed badly in low-altitude defense. In order to ensure a tight grip on the airspace, the Army began to reissue the M42s to the Army in the air defense artillery battalions which contains four M42 batteries and one headquarter battery. These M42s start arriving in the fall of 1966 in three battalions, 1/44th, 5/2nd, and the 4/60th battalions. Though, despite their role, no dire air threat was presented from the North Vietnamese to the South, so the M42s were relegated to ground support duties in a tradition shared by its past predecessors. The M42s in this role was deployed as on-point security, convoy escorts, or a perimeter defense; it was in these roles that the M42 earned its nickname "Duster" for its lethality and effectiveness in ground support roles against the infantry. After Vietnam, the M42 Dusters-equipped battalions were deactivated in late December 1971. These Dusters still in Vietnam were given to the ARVN forces. Training dusters at Fort Bliss were given back to the National Guard it was originally issued to, and multiple National Guard units were stationed with the M42 until it was officially retired in 1988, with the last unit retiring it be 2nd Battalion, 263 Air Defense Artillery. 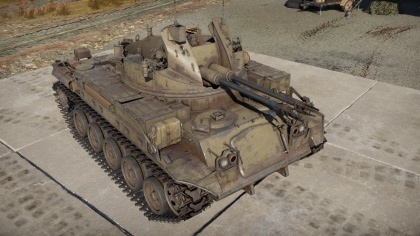 Skins and camouflages for the M42 Duster from live.warthunder.com. This page was last edited on 19 March 2019, at 19:11.